Home > News & Blogs > Accident Claims > Are Britain’s roads too dangerous for cyclists? Are Britain’s roads too dangerous for cyclists? Research has shown that most people, particularly Londoners, feel unsafe cycling on the road. A recent poll conducted by the BBC of 3,012 people indicated that over half of British adults believe that the roads in their local area are too dangerous to cycle on. This figure is highest in London where 59 per cent of adults agree. In addition, the BBC’s research showed that only a third of people in Britain think that the roads in their local area are designed to be safe for cyclists. Also, older people in Britain are wary in comparison to the younger generations, with 61 per cent of people aged over 65 considering Britain’s roads to be unsafe for cyclists, compared to 45 per cent of 18 to 24 year olds. The Tour de France recently made its way down the country through Leeds, Harrogate, York, Sheffield, Cambridge and London. This was only the second time that the competition had started in Britain in its 101 year history. Despite being the world’s biggest sporting event, only one in five people that took part in the BBC’s investigation said that The Tour de France had encouraged them to cycle more. Transport for London (TfL) has recently launched a draft Cycle Safety Action Plan (CSAP). 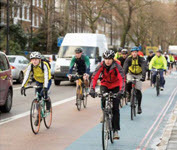 The CSAP details TfL’s strategy for improving the safety of cyclists in London where, according to the BBC, statistically most people feel that cycling on the roads is too dangerous. Although most Londoners do consider the roads to be unsafe for cyclists, the number of people that cycle to get around London has almost tripled over the last decade. In 2012, nearly 600,000 trips a day were made by bicycle in London alone. So, is the public’s perception of the London’s roads being too dangerous for cyclists justified? The draft CSAP contains some interesting statistics on the number of cycling casualties and the causes of the accidents. In 2013, 489 cyclists were killed or seriously injured (KSI) on London’s roads. This figure represents 21 per cent of all KSIs in London that year. The number of KSI’s is gradually reducing and it is the aim of both the Mayor and TfL to reduce the number of all KSIs by 40 per cent by the year 2020. According to TfL, cyclists face the second highest risk level of road users in London, after motorcyclists. Different age groups experience different levels of risk. Child and teenage cyclists are the most vulnerable. The risk then gradually declines through to the age band of 45-49, where the risk is approximately one third of that for 10-14 year olds. The highest casualty numbers occur among cyclists aged 25-35. This reflects the popularity of cycling in this group. Interestingly, men experience a small increased risk in comparison to women. Whilst most cycling KSI collisions involve cars, a disproportionate amount involves heavy goods vehicles (HGVs), taxis, busses/coaches and motorcyclists in relation to their respective traffic shares. In terms of the location of the accidents, significantly more casualties occur in inner London, due to the greater number of journeys made. Also, 84 per cent of collisions involving cyclists occurred at or within 20 metres of a junction. This demonstrates the importance of safe junction design and operation. The manouvere that most commonly results in a KSI to a cyclist involves another vehicle in opposing traffic turning right across the cyclist’s path. The second most common conflict arises when a cyclist and the other vehicle involved are travelling alongside each other, for example, overtaking and undertaking. The conflict ranked third is the scenario where drivers and passengers open their doors into the path of a cyclist. I was surprised to read that excessive speed of the other vehicle involved does not appear to be a major factor in cycling collisions. A mere three per cent of all cyclist casualties during 2010-12 were the result of speed-related collisions. However, where speed of the other vehicle involved is a factor in a cyclist collision, it is more than twice as likely to result in a fatal or serious casualty. The most common contributory factors recorded by police attending the scenes of cyclist KSI collisions during 2012 were: ‘failed to look properly’, ‘careless/reckless/in a hurry’ and ‘failed to judge other person’s path or speed’. These factors apply to both the cyclist and other vehicles involved. TfL confirm the BBC’s findings within the CSAP by pointing out that Londoners are concerned by the safety of the roads. However, the TfL go further by stating that Londoners consider the need for change to lie with others rather than themselves. TfL consider this to be a fundamental barrier to improving road safety. Cycling has its obvious environmental, economic and health benefits. It is therefore my hope that, with the help of the TfL’s initiatives, the public’s perception of the cycle safety on London’s roads will be more positive in future and more people will take to two wheels. You can find TFL’s full action plan on the TfL website, or by clicking here. If you or a loved one have been involved in a cycling accident, which has resulted in a serious injury, please do not hesitate to discuss your potential claim in confidence with one of our specialist personal injury solicitors free on 020 7288 4800.